Nigerian singer, Davido has expressed fear following an air turbulence that lasted 14 hours during a flight to the John F. Kennedy International Airport in the United States of America. 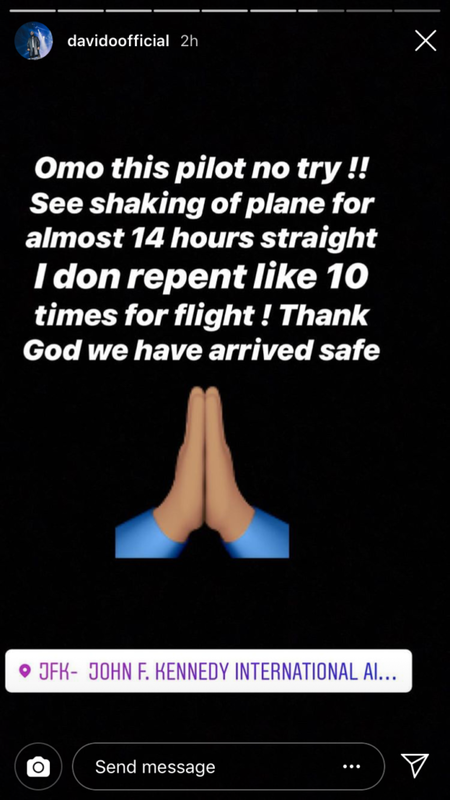 The singer took to his Instastories to share that he had to repent his sins about 10 times over as a result of his fears. Davido however arrived his destination safe and will be performing at the Orlando Carribean Festival later today. davido, you are ungrateful. do you know if it was the pilot,s experience that made the plane to land sefely? the plane was shaking and what fault of the pilot is that? do you need to be told that the plane had mechanical problems that were not caused by the pilots.